Barrels Of Fun Keeps 'em coming back again and again! 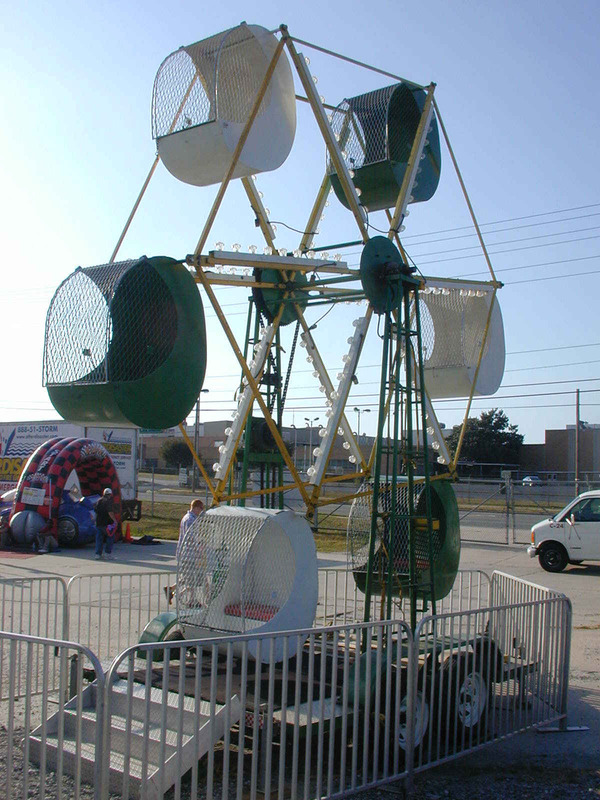 Passengers use the wheel in the center of the barrel to control how fast or slow this ride goes! Has electronic timer for standardized ride cycle. Ride is elevated for greater visibility of tropical theme. More fun than a barrel of monkeys!! (4-6 passengers per barrel). Safety fence and ride signs included. NCDOL inspected. Ride operator provided by REQ., Inc.
Buggy Carriage Ride Get noticed!!! Sure to be a hit these three oversized "rickshaw" type (A two-wheeled oriental carriage drawn by one man) cars, pulled by a golf cart, convey your guests in style! Decorated in red, yellow and blue, each car has a tropical motif. Holds up to four riders per car (12 total). Great addition as a shuttle or use as a single attraction! Get moving! Carousel Great for all ages! Come one, come all to experience our lighted 15-horse musical Carousel. 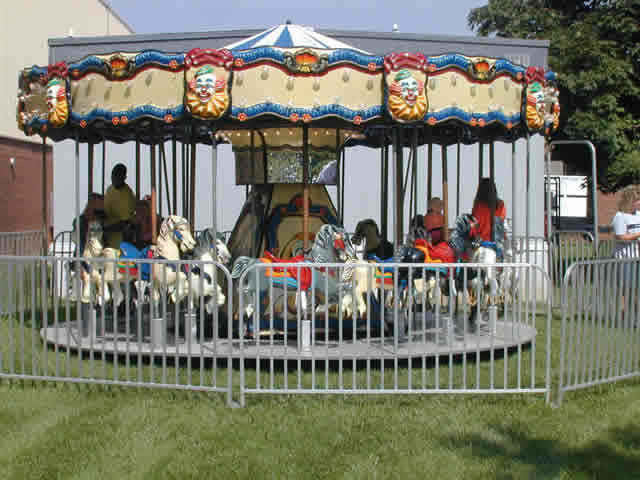 Our Carousel is specially equipped with 5 stationary horses for beginners! Hand-painted works of art, these beautiful horses will add a touch of class to every event! Safety fence and ride signs included. NCDOL inspected. 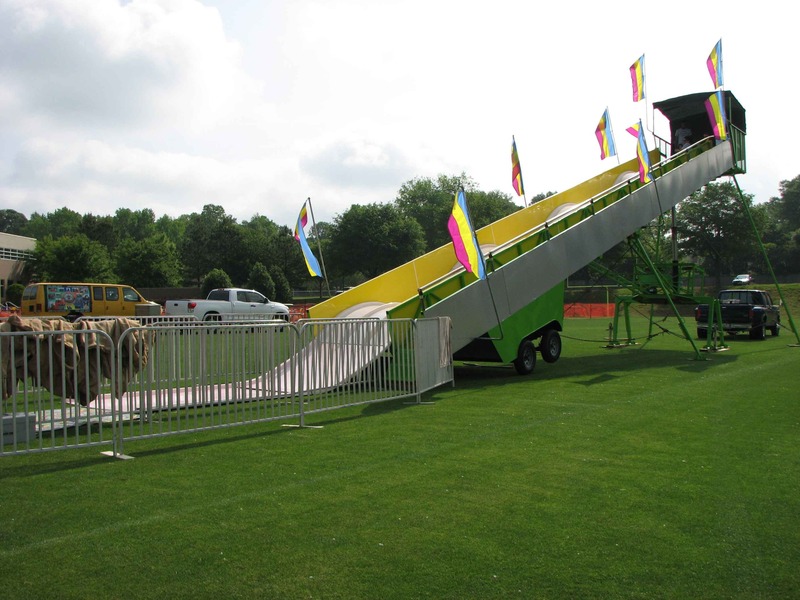 Ride operator provided by REQ., Inc.
Camel Slide 35 feet tall, 90 feet long, 3 separate lanes of slippery, camel racing fun. Safety fence and ride signs included. Ride operator provided by REQ. 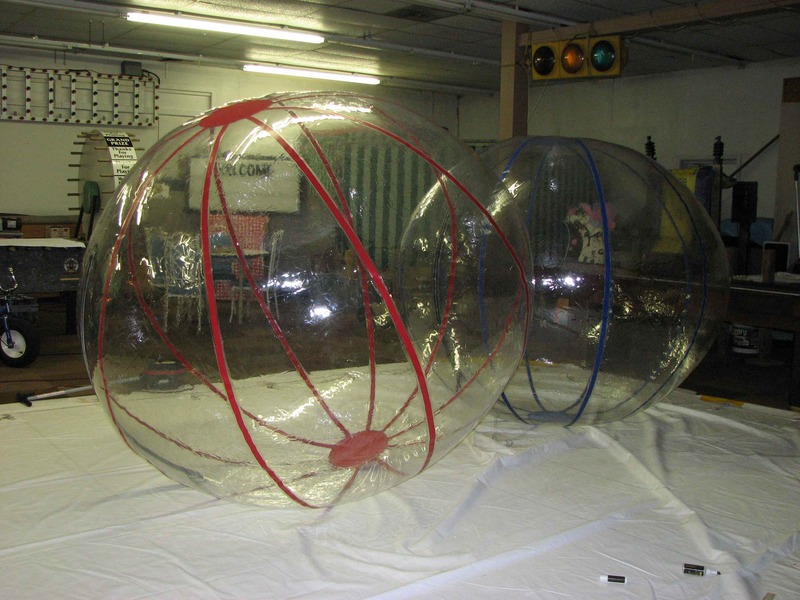 The most fun you can have while enclosed in a 6 foot giant inflatable human sphere. 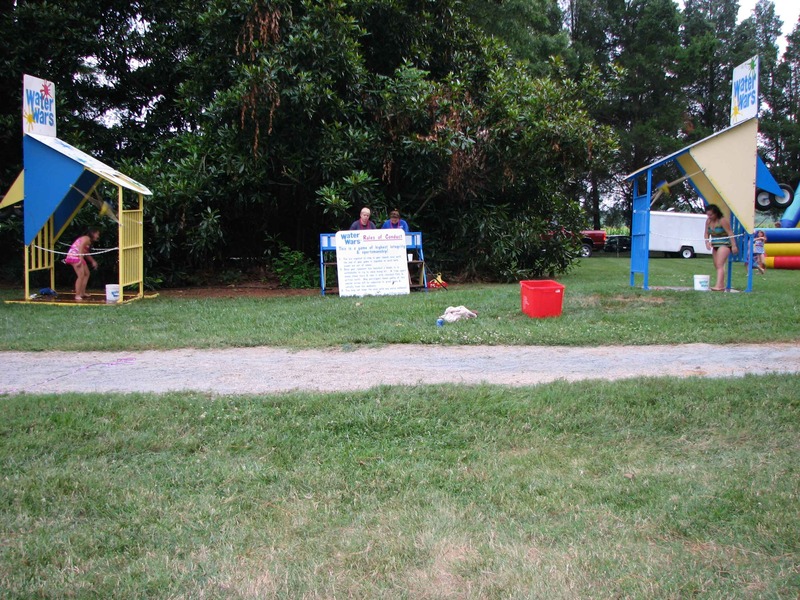 Participants use a course setup that incorporates a cross-over of their paths. It pays to be quick on your feet, because getting to the cross roads first means that you win the contest. Course is 100' long and 14' wide. Daytona USA Racing Simulators These linked games allow exciting racing against each other on the same virtual track. Available in packages of 2 to 8 machines. 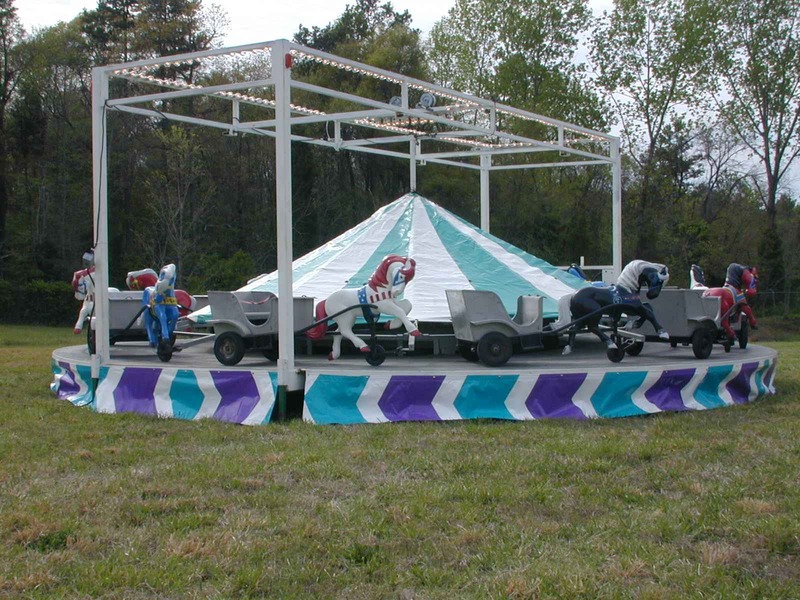 Let us roll them indoors or use our air-conditioned trailers for outside events. Dunk Tank A definite crowd favorite! Put on your water wings! Each brightly colored tank holds 500 gallons of water. Softballs are used to hit the target which dunks the seated person in the water. Great for Bosses Day, employee appreciation, corporate events, family gatherings, birthdays and more! 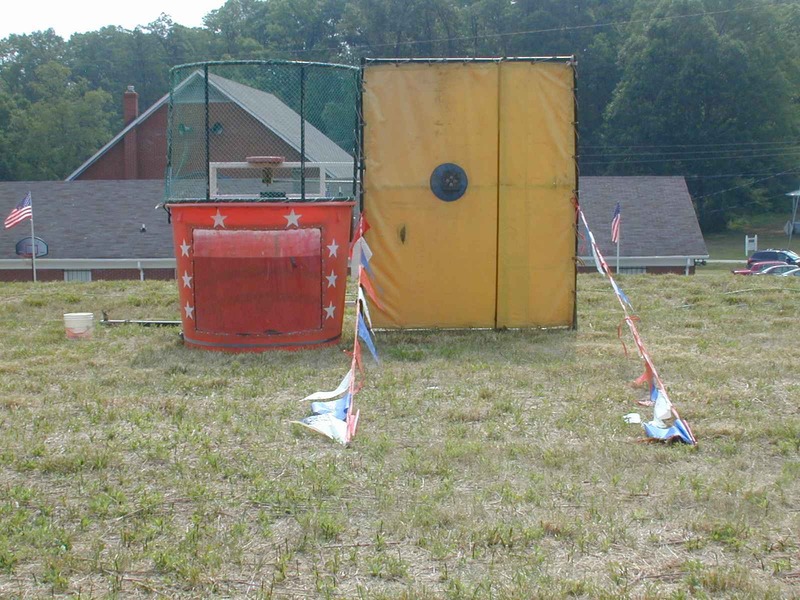 Each tank has a see-through window so you are able to watch the dunkee when they fall into the water, and a safety barrier to protect the dunkee from thrown balls that miss the target. Customers are to provide the hose and water to fill up the tank. Electronic Hi-Striker Ultra modern version of an American classic! Imagine trying to "ring" the bell on this electronic Hi-Striker. This version at a total height of 26 feet is perfect for your larger events or events needing that all important FLASH!! Not only does it flash like a lighting bolt, it has lights flashing, strobes exploding, and speaks with every hit (dozens of good humored comments)! Sound system uses dual state of the art 100 watt loud speakers. Your score automatically displays at the top in 12 inch high lights. Great crowd entertainer. Most versatile Hi-Striker available. Can be used by men, women, and children alike with just the push of a single button. No more having to rent a "big" one and a "little" one. Go on...GET A HIT!!! Comes with men's 11 lb., women's 7 lb., and juniors 4lb. hammers. Safety fence and signage provided by REQ Inc. Hi-Striker comes in 12-foot and 24-foot versions. 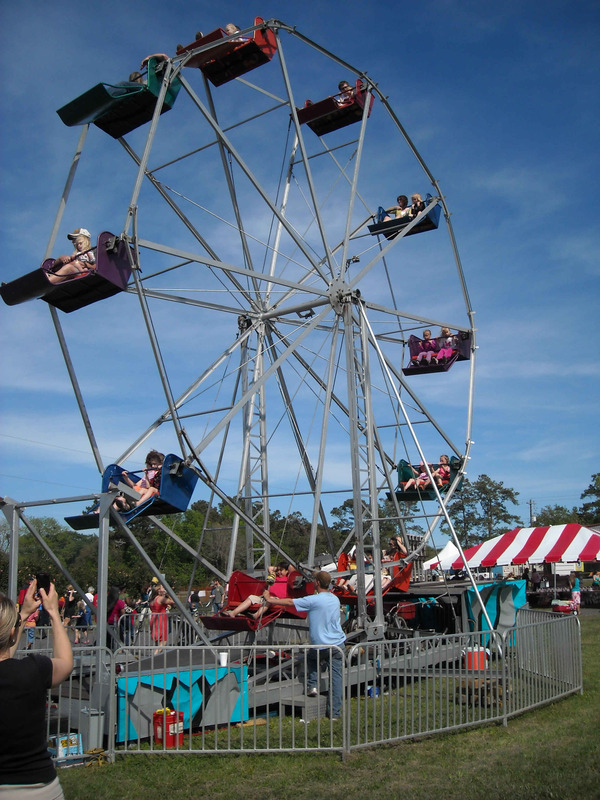 Ferris Wheel Achieve the nostalgia of a carnival with our 40-foot tall Ferris Wheel. For over 100 years the ultimate crowd pleaser! Ten colorful, open-air seats equipped with safety lap belts. Has the ability to run both forward or backward. Sit back and enjoy the fun! Available with or without light package. Safety fence and ride signs included. NCDOL inspected. 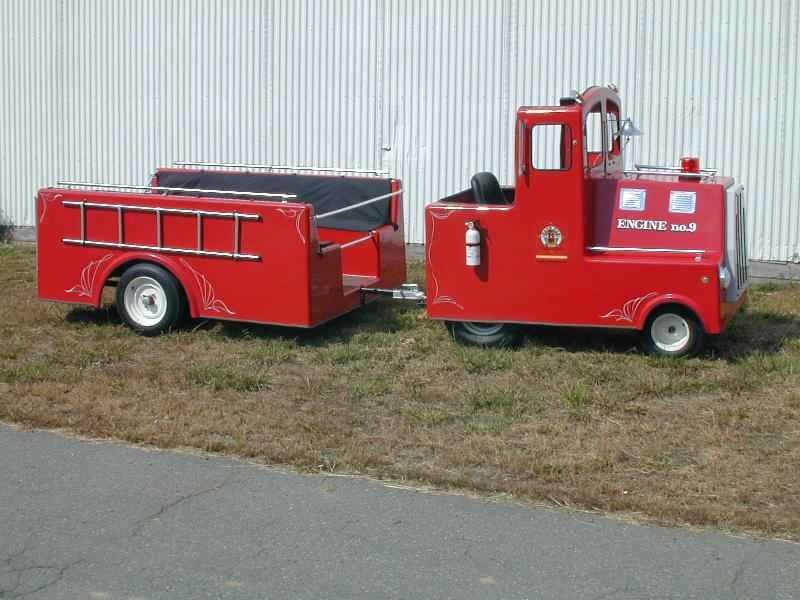 Ride operator provided by REQ., Inc.
Funday Firetruck Authentic looks of Hook & Ladder firetruck. Ideal for use at school, church, or community events. Comes with driver and seating for 12. Plus, included are a clanging bell, siren, and flashing red dome lights. 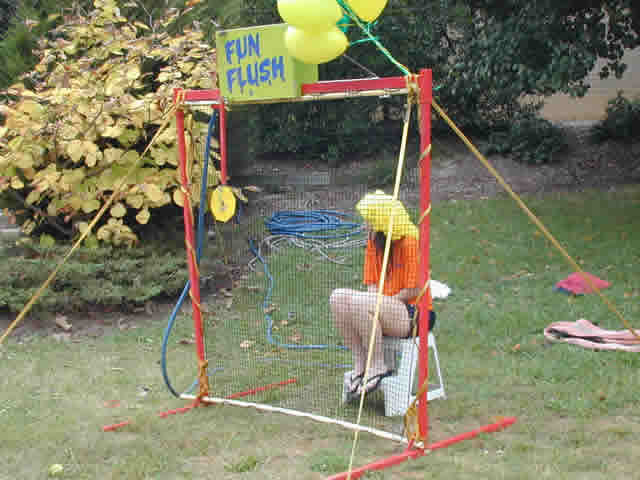 Fun Flush Water Soaking Target Great alternative to a dunk tank...no swimming skills necessary, no ladder to climb (great for children and older adults). Participants use tennis balls to make the water flush from overhead instead of the participant falling into the water. Water refills the overhead tank automatically. Customers to provide hose and water to fill up tank. 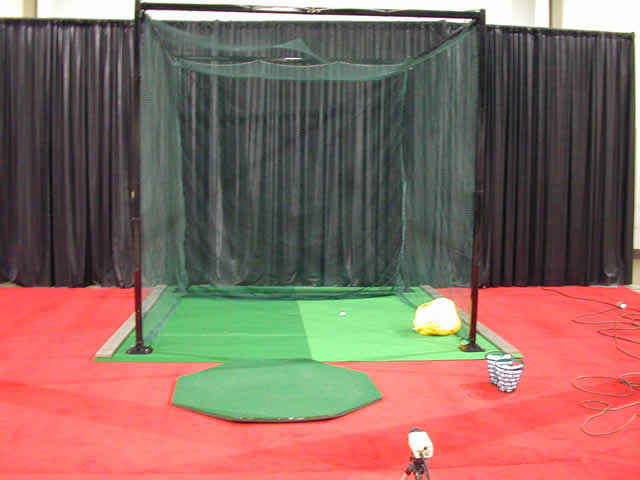 Golf Driving Range How far can you hit a golf ball? This golf radar unit measures the drive of the golf ball and displays your carry distance. Great for indoor parties or outdoor tournament use. Completely enclosed double walled safety netting ensures endless hours of fun and challenging competition. Hay Ride A real country ride. 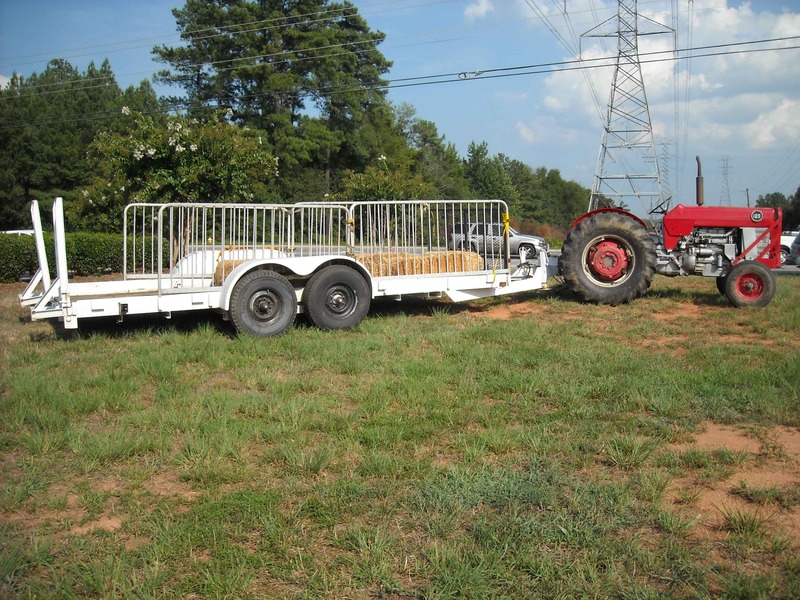 Bounce along with your friends in this authentic Farm Tractor and Trailer combination. Great for family, church and fall outings! Up to 24 people can ride at a time. Hydro-Shot Water Balloon Extreme water balloon battle! Bombs away! Balloons are launched toward opposing target base OR both units can launch at stationary targets. Highly versatile, target-oriented, accuracy-based water fun! Be prepared to get WET. Great for HOT days. (Whip cream or Jello optional...use at your discretion)! 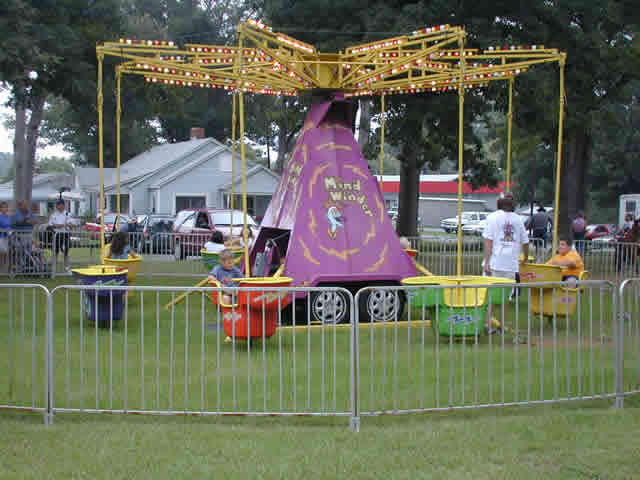 Jitterbug Swing Ride Not for kids only! Teens and kids alike enjoy our exciting 20-seat chair swing ride fully equipped with flashing lights. Same great stuff you see at the fair! Great for larger events. Safety fence and ride signs included. NCDOL inspected. Ride operator provided by REQ., Inc.
Karaoke Have you ever dreamed of becoming a professional singer? A popular mix of all time favorites, this versatile unit uses digital technology to eliminate CD's while offering over 750 selections. Our karaoke machine comes with 2 microphones and 2 sets of song sheets that list all of the available song options. You and your friends can have hours of fun "performing." Available with or without a TV monitor. Karaoke machine is cable ready. Keg Barrel Racers Race to the finish line on our spectacular barrels equipped with mountain bike handlebars and wheelchair motors! Each barrel holds 1 participant. 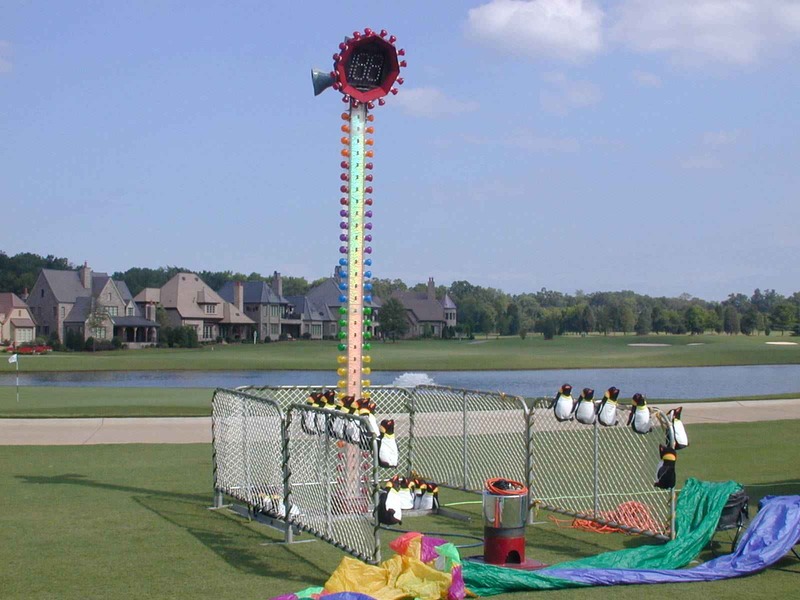 Great for team building experiences and more! Gotta go, gotta go! Kiddy Chair Swing Ride Big fun for little ones! 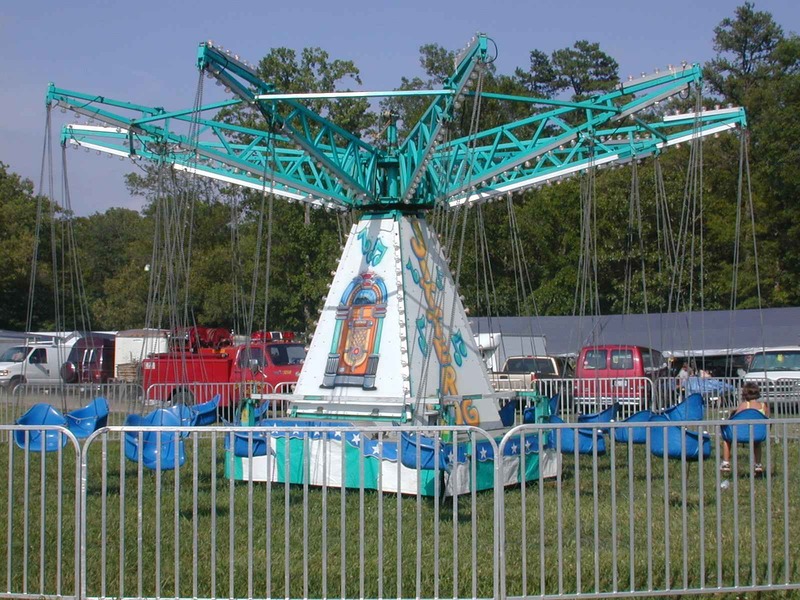 The children sit in a colorful swing seat with a seatbelt as they are whirled round and round. Ride is equipped with over one hundred turbo lights, adding enjoyment well into the night. Safety fence and ride signs included. NCDOL inspected. 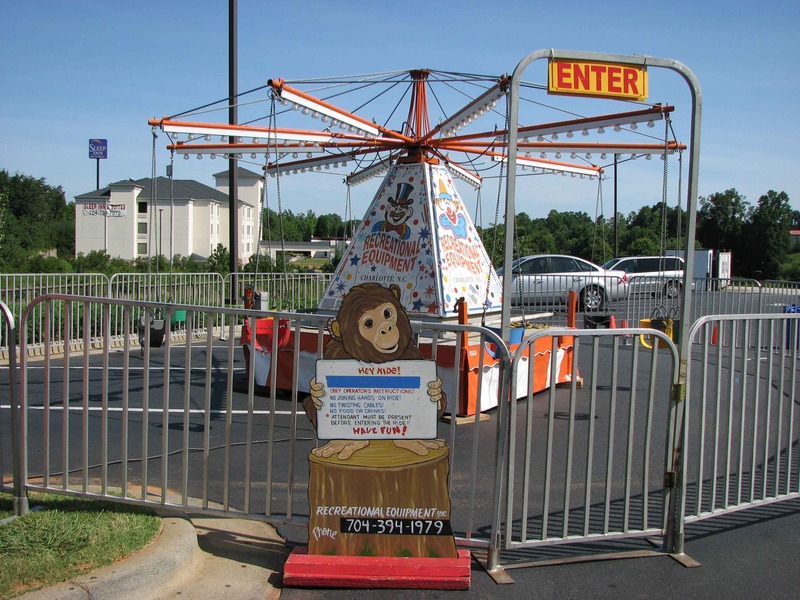 Ride operator provided by REQ., Inc.
Kiddy Ferris Wheel Come ride in the clouds! There are 6 green and white enclosed cars. Maximum capacity 150 pounds per car. Ride holds up to 12 children at a time. Includes safety fence and ride signs. This ride has lights for added evening appeal. NCDOL inspected. Ride operator provided by REQ, Inc. Mechanical Hi-Striker Test you're strength! Use the mallet to blast the top off! Close counts, but ring that bell and you're the champion. Nostalgic old time favorite, a sure winner. Challenging for older children, teens, and adults. Hi-Striker comes in 10-foot and 14-foot versions. Micro Reality Motor Racing The remote controlled racecars (not slot cars) are on a banked speedway. 2 CD sound system. Miniature Golf This will be the ultimate golf experience! Get your putters polished up because this will give you bragging rights for years to come!! 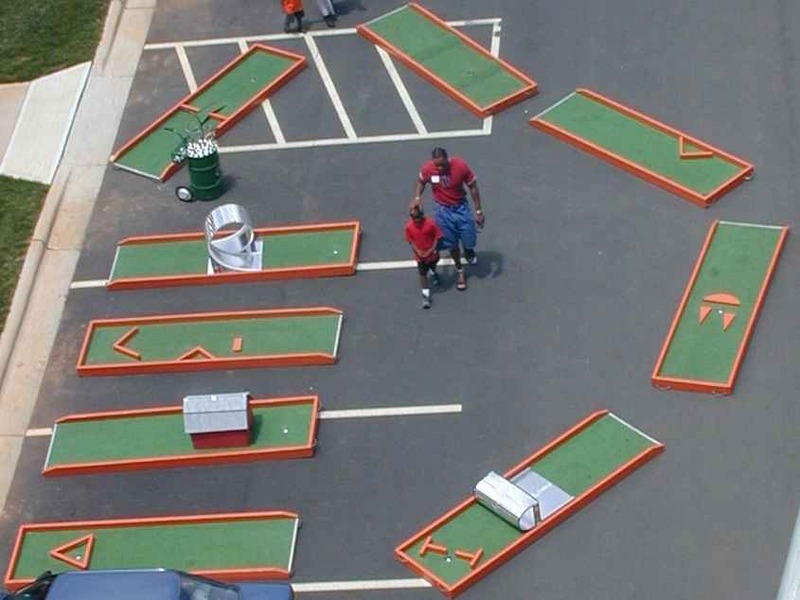 Miniature Golf comes in 4-holes, 9-holes, 9-hole deluxe and 18-holes. This fully restored 1954 Allen Hershall Pony Cart Ride is one for the ages. Each cart can hold two children. Carts are "pulled" by a classic hand-painted carousel horse. Great piece for any size event. 10 carts. 20 child capacity. Ride operator provided by REQ. Rapid Slide Swoosh! 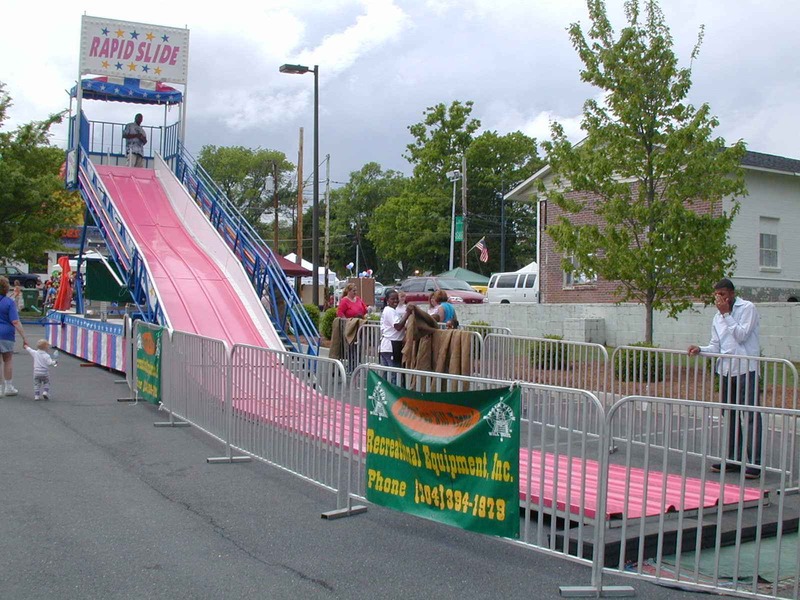 Grab a burlap sack and take an exciting ride on our three-lane, 65-foot long fiberglass slide!!! A structural (steel-frame) slide with three separate lanes accommodates over 400 people an hour. Great item for large events. With its fluorescent side lights and turbo running lights this lighting package is sure to dazzle. Definitely for the upscale event! We recommend that children under the age of 4 be accompanied by an adult. Safety fence and ride signs included. NCDOL inspected. Ride operator provided by REQ., Inc.
Red Baron Bi-Plane Ride Imaginations take flight as children soar through the skies in their very own plane! 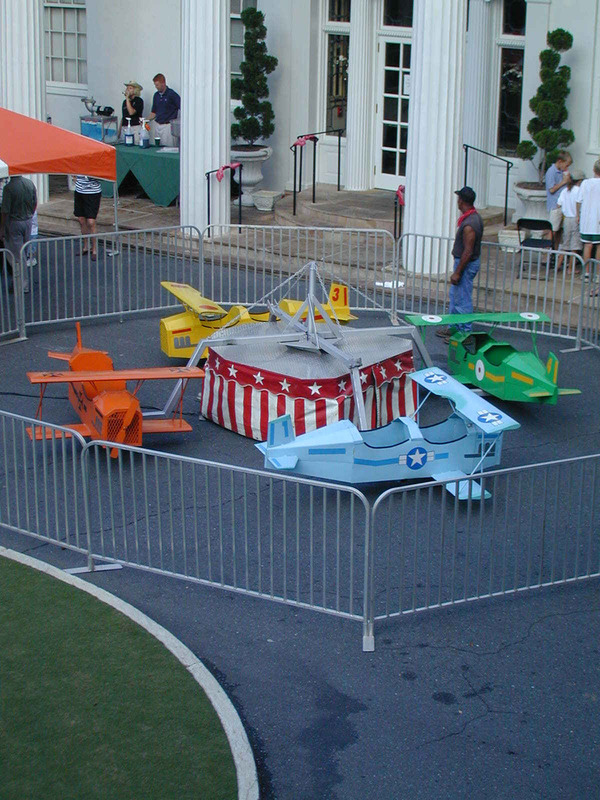 This attraction circles while elevating the "pilots" approximately 4 ft. into the air. Each two-seater plane resembles a vintage Bi-Plane with a bright color scheme sure to inspire our young heroes. Safety fence and ride signs included. NCDOL inspected. Ride operator provided by REQ., Inc.
Rodeo Roping Round 'em up cowboy! 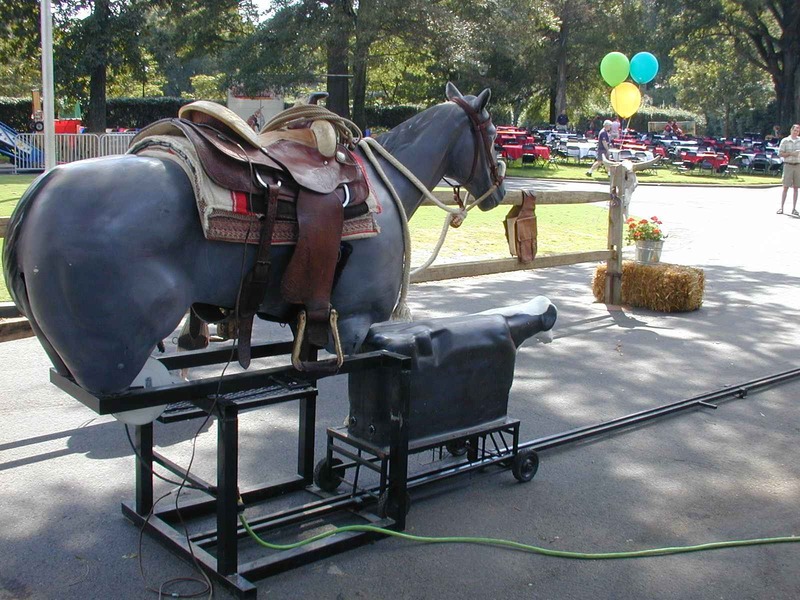 Participant sits on a stationary horse while attempting to rope an electric calf that "runs" out on a guided track directly in front of the "rider". Perfect for any Western theme event. Sports Arena Can you throw a baseball as hard as Nolan Ryan or a football as hard as Dan Marino. Maybe kick a soccer ball with the velocity of Pele'. With our sports arena you can determine how you stack up. It will instantly calculate how fast you can pitch a ball, throw a football or kick a soccer ball. Great competitive fun for all. 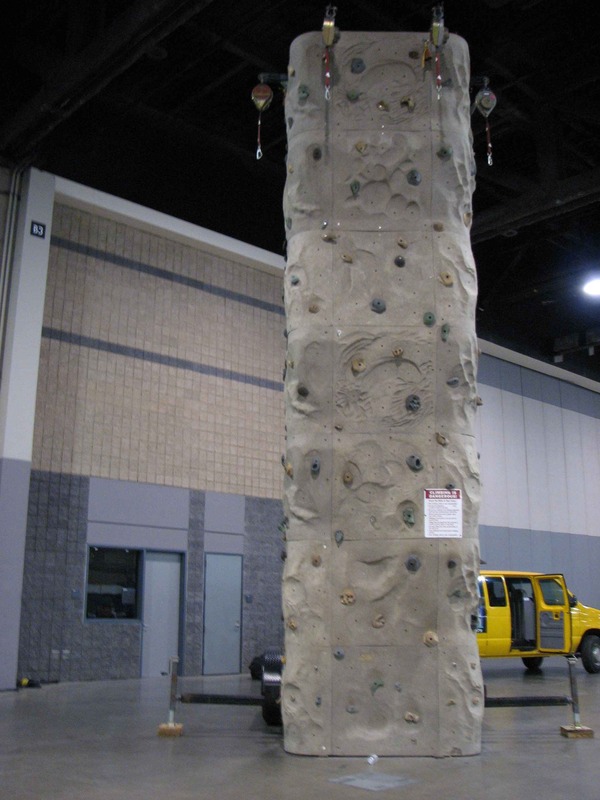 Structural Climbing Wall 4-person granite climbing wall provides safe and realistic climbing for the adventure of reaching the summit, followed by repelling back to Earth. Safety fence and ride signs included. Trained operators provided by REQ. Sumo Wrestling Come play with the BIG boys! 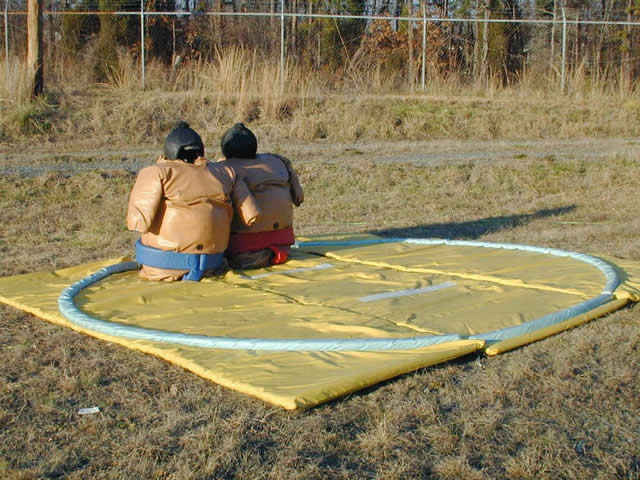 Two foam adult Sumo suits with helmet hairpieces and a 15'x15' Sumo mat. Great fun to wrestle or watch! Referee provided by REQ, Inc. So bow to the fun and SUMO!!! Trackless Train Chug-a-chug-a Choo! Choo! 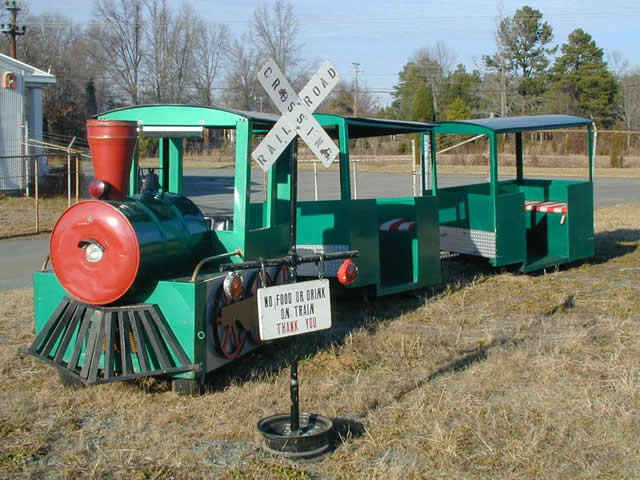 Our trackless train, with bells and sirens sounding, is fun for all ages! It has a 12 horsepower engine pulling two shiny green passenger cars. Fun runs on time...all aboard! Holds up to 12 passengers (adult or child). Great for corporate events, school fund raisers, church gatherings & more! Flat, paved surface needed for optimal operation. Not recommended for steep inclines. 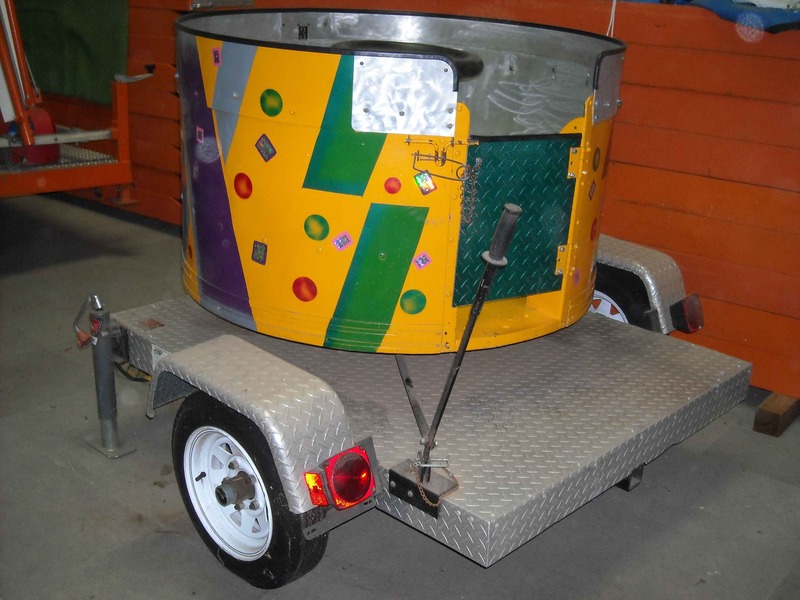 Driver is provided by REQ, Inc.
Trampoline Thing Safely catapult yourself up to 20 feet via bungee cords. 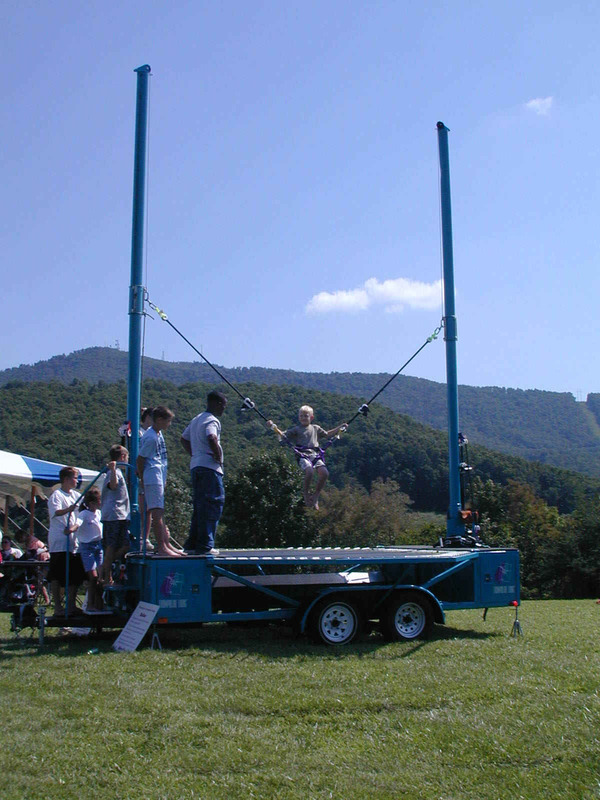 Participants are guided by 20 foot poles on either side that other ends of bungee cords attach to. Participants can be 60-280 lbs. Correct number of cords according to weight of person allows maximum safety and height. Tub of Fun Single tub version of the larger Tubs of FUN, the unit seats up to six kids while they turn the center wheel to spin the "tub" in either direction. Operator has a handbrake to aid in stopping and keeping in place while loading and unloading. Ride operator provided by REQ. Tubs Of Fun Round and round and round we go! Sit in the circular "tub", grab the wheel and spin yourself silly. Safety fence and ride signs included. NCDOL inspected. Ride operator provided by REQ., Inc.
Video Snowboarding Ready, set, go! See how well you can snowboard in a timed downhill video snowboard race. Just as much fun to snowboard as it is to watch! Competitor interacts with game by standing on actual snowboard which functions as game controller. Board is approximately three inches off the ground. Feel the burn! 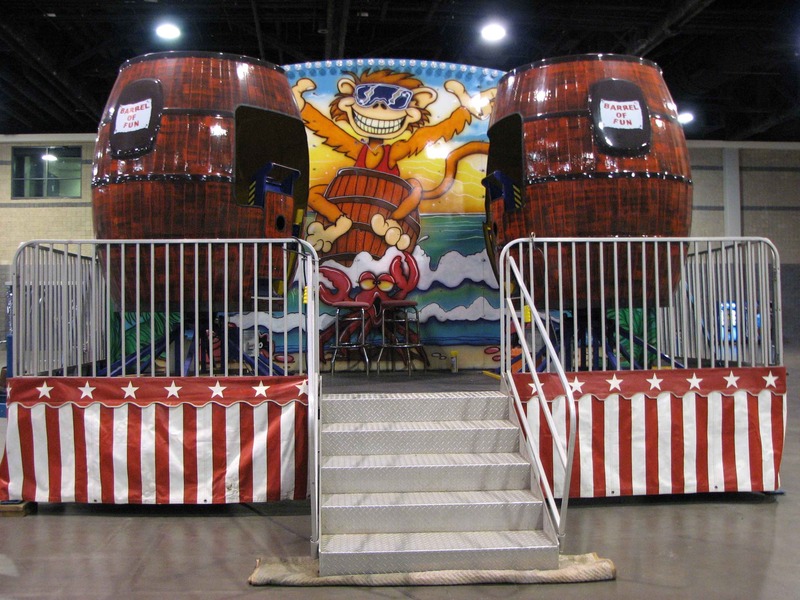 This ride will amaze your senses and challenge your stamina! Water Wars Why get wet when you can get SOAKED? Two players launch water balloons at opposing battle station using a patented sling shot mechanism. Each player gets three to five balloons to allow for maximum number of players. 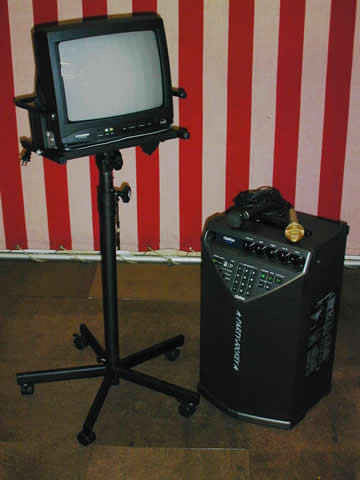 Battle stations have deluxe graphics and are brightly painted. Safety grid framework prohibits full balloons from entering battle station. Player stands on wooden deck incorporated into the base of battle station. Comes with four gross balloons, deluxe water fill station, pennant flags, rules sign and 50' garden hose. Additional balloons available, please ask when booking. Copyright © 2004-2015 Recreational Equipment, Inc.